Does your mother have a smile that could brighten the darkest day? Does her appearance mark good news? Does she always know just what to say? Then like the flash of joy a firework imprints across the dark, thank your mother for her vibrancy. For how she's left her mark! 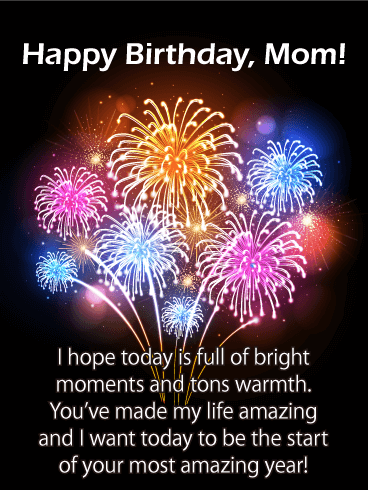 The Fireworks for Mom Birthday Card will celebrate that special lady, the way she deserves to be celebrated. The way she herself celebrates each and every day. 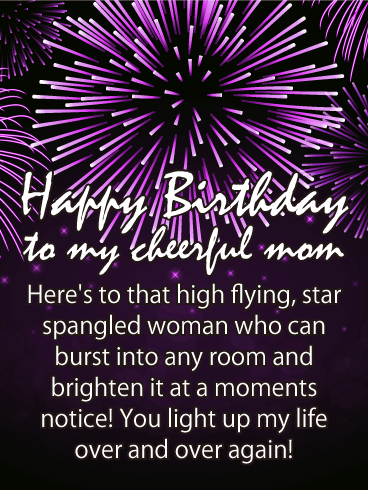 Happy Birthday to my cheerful mom - Here's to that high flying, star spangled woman who can burst into any room and brighten it at a moments notice! You light up my life over and over again! Your mother is an amazing woman and you want her to know you recognize how incredible a person she is overall! 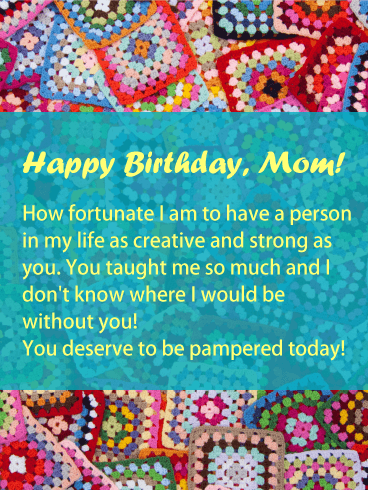 Send her this beautiful crocheted happy birthday card to acknowledge all the brilliant hard work she's put into raising you! She's always been there for you, and today you want to remind her you will be there for her! Is your mother one of those people who loves fireworks? If so, then this is the birthday card for her! It features a stunning fireworks display with hints of purple, pink, and blue. It will add a little excitement to her day too! The large fancy lettering is featured in bright pink and can't be missed. 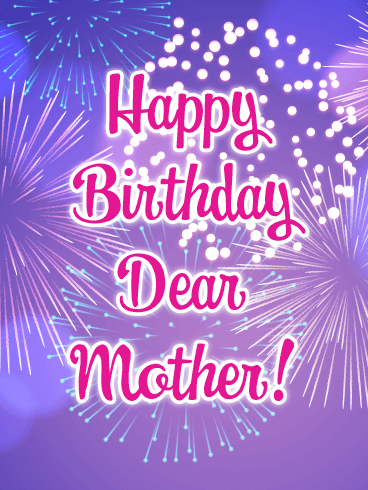 It will wish your dear mother a happy birthday the moment she sees it! Send these lovely celebration fireworks over to your mother before the shows over! Let mom know how you truly feel about her this birthday by sending this crazy cute birthday card full of colorful crocheted squares! The happy birthday card affirms what a strong, positive influence she’s had on your life, and tells her how much you believe she deserves a day of relaxation and bliss! Moms do it all, but on their birthday they shouldn't have to! This beautiful, blue-hued card of tile mosaic serves as the perfect backdrop for wishing the wise woman we call mom, a happy birthday. We wouldn't be here without her, and she spent her whole parenthood teaching you how you fit in the world. 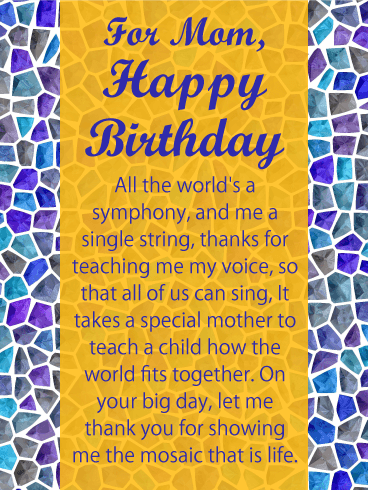 Thank her for all the art and connectivity she taught you, with this Mothers Mosaic Birthday Card. 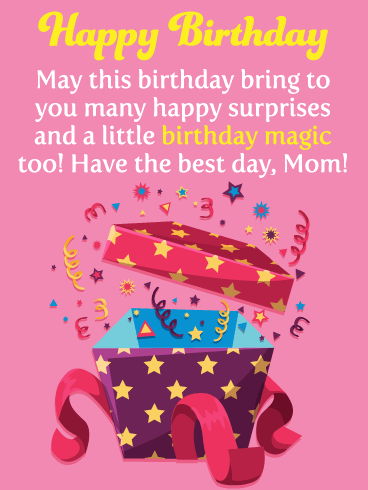 Send a little birthday magic over to your mother this year, along with wishes for a happy birthday. This birthday card showcases a sensational gift box that has a magical look. Confetti is bursting out along with its bright pink ribbons, an awesome site to see! It will make your mother wonder what surprises will be waiting for her when she opens up her birthday presents during her celebration. 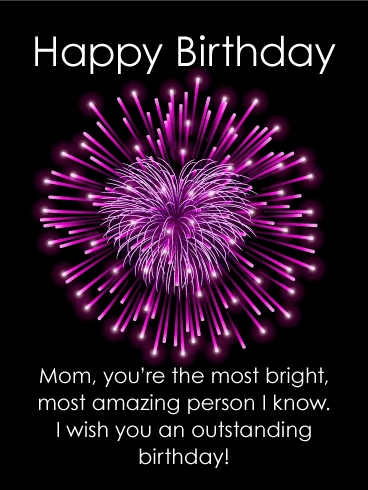 Get this dazzling birthday card over to your mother today! This birthday cake looks terrific, and so do the candles and decorative stars! The candles are lit and ready to be sent to your mother for her big day! 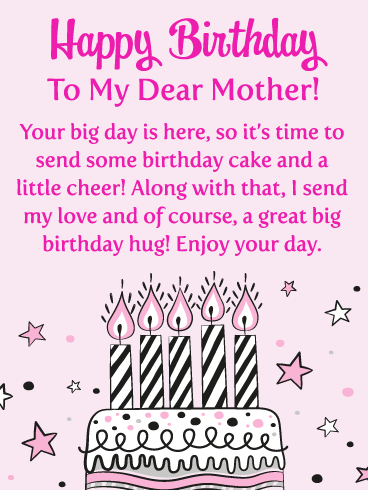 This birthday card will remind your mother of the festivities to come! Your mother will also be filled with joy when she reads that you are sending her your love. So thoughtful! 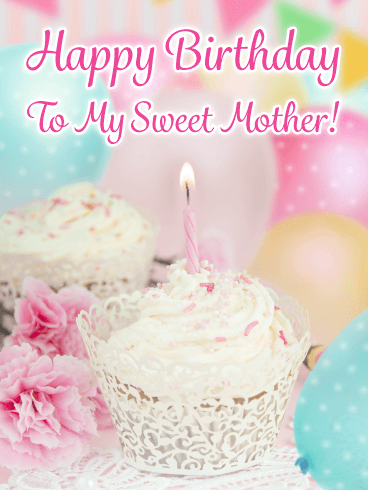 Send this pretty birthday card to your mother so she knows you are thinking of her on her birthday! Send your fun mother a birthday card that reflects her personality! This great greeting card is filled with happy bright colors, fun shapes, and has a wonderful celebration theme. 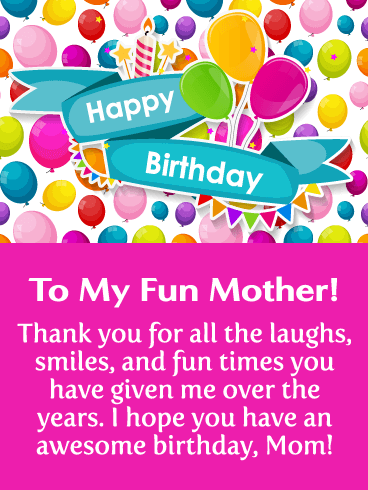 Your mother is going to really love the message that thanks her for all the fun times, smiles, and laughs! 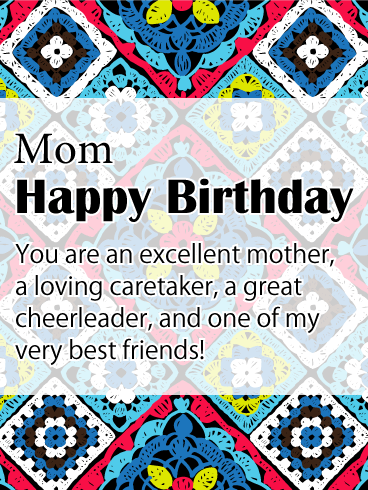 Wish your mother an awesome birthday and brighten her day with this joyful birthday card today! A mother is the stained glass window that mellows the oftentimes harsh light of reality. 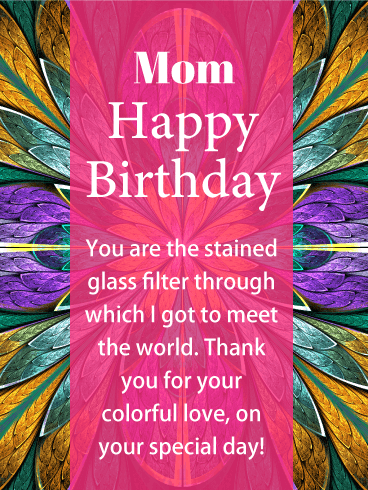 On Mom's birthday, tell her you appreciate all the times she made the hard lessons of life, feel like little gifts, with this Stained Glass Birthday Card. Its vibrant colors, and direct message will leave no room in her mind for doubt. She added nuance and grace to the life she created, so she deserves to be celebrated. 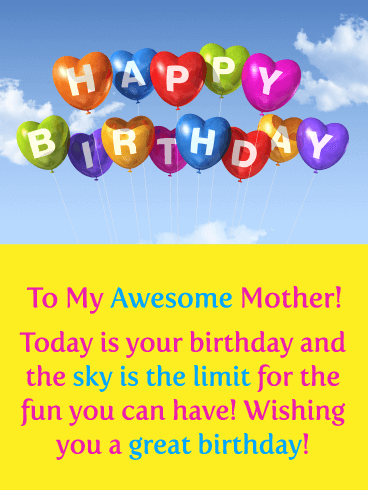 Remind your awesome mother that the sky is the limit for the amount of fun she can have on her birthday with this delightful birthday card! It creatively displays colorful heart balloons that spell out the words Happy Birthday! She will be thrilled that you sent such a unique and fun birthday card. Be sure to send these balloons over to your mother today to wish her a happy day!